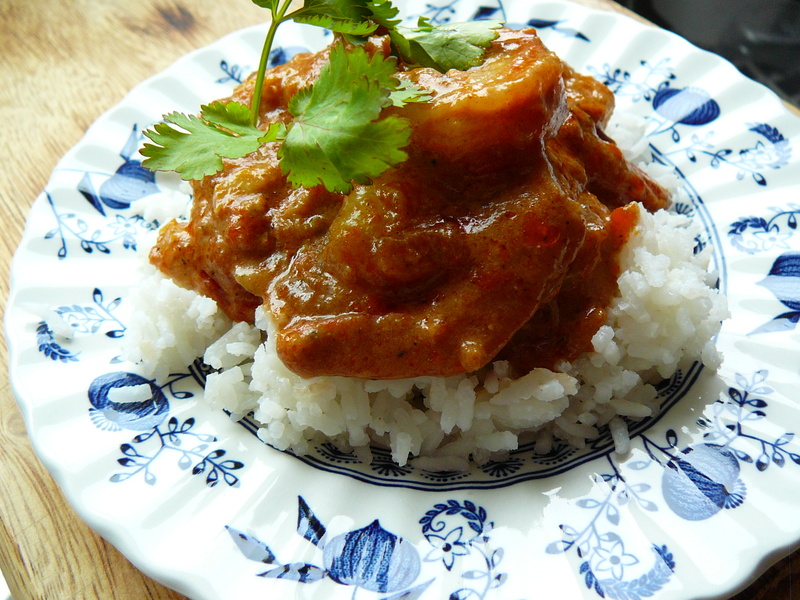 I know the title says chicken curry – but the sauce made an awesome Prawn Masala another day! I don’t know how I have managed to forget about getting this recipe on here! It is a tried and true favorite, and as delicious as it is the first day – even better the 2nd. I always find my curry recipes make more sauce than needed on the first night and so the sauce will show up with a different protein or vegetable a couple days later – tasting amazing. In large pan, heat oil or ghee on medium heat until shimmering. Add onions and cinnamon – saute for 5-8 minutes until they have reached a rich, golden yellow color. Add garlic and saute for another few minutes. Add ginger, tomatoes, salt, black pepper, turmeric, cumin, coriander, garam masala and cayenne. Cook this over medium heat until the oil separates from the masala. Remove and discard cinnamon stick. Stir in cilantro just at serving time and serve with basmati rice. We also love it served with Roasted Tandoori Cauliflower with Mint Cilantro chutney …. yummmmmmy. Try this with cooking the masala, and then stirring in a vegetarian option of tofu or vegetables! Also amazing with any number of seafood options – pictured today here with prawns. This entry was posted in Recipes, Vegetables and tagged Chicken, chicken curry, curry, Indian curry, main dish, prawn curry, prawns, side dishes, tomatoes, vegetable curry, vegetarian by Chatty Kathy. Bookmark the permalink.